Dressing dapper is a lifestyle choice not reserved for the rich and famous. Dapper is all about the details, and something every man can enjoy. If you’re ready to up your fashion game, we have some quick tips and tricks on how to pull together a classic outfit with all the trimmings. You don’t have to max out your credit cards like Kanye to get these looks – all you need is a willingness to stay sharp, and care about how you dress – that’s it. We bet with these simple life hacks, you’ll see a huge difference on day 1. Try them out and see how awesome you’ll look and feel. Trust us these will help you turn heads. Have a questions about dressing dapper? Leave a comment below and we’ll point you in the right direction with some extra style pointers to boot! Short-sleeve shirts make you look Dwight Shrute-ish. That’s a distasteful fact. Instead, flatter yourself in a traditional long sleeve shirt and master the art of the roll up sleeve. This look oozes dapper style as you have all the kudos of wearing a long sleeved shirt, but with casual appeal. Dressing dapper is as much about the attitude as it is about the details, so there’s no need to reserve this look. It works as an everyday fashion fix. Plus, the short sleeve roll will give you a bout of not-so-trying sophistication when transitioning from work to the bar, making it as useful as it is awesome. And the ladies love it. Bet that. Unless you’re going for Jersey Shore, keep gym wear where it belongs, in the gym. Nothing says you don’t care about how you look than prancing around in an old pair of sweat pants. The dapper man would never be caught dead in public wearing anything less than a well fitted denim. Instead, look for comfort fits in all your favourite pant styles so you can be dapper and comfortable every day of the week. Khakis are surprisingly forgiving, look sharp, and still retain a causal appeal that’s perfect for lazy days. Be sure to pack a Superman style change of clothing once you get done at the gym. 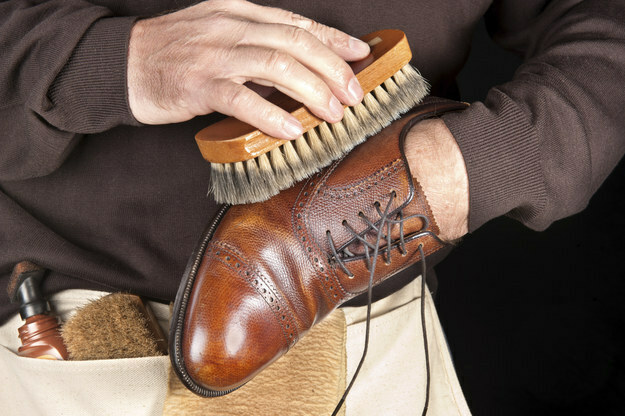 Elbow grease and a shoe shine kit are all you need to step out into a new pair of shoes. Transform your planks into a showstopping attraction by shining them at least once a week. Remember, being dapper is all about the details. If you think people don’t notice shoes, think again. A few accusatory scuff marks can ruin a well thought out outfit. It says, I tried, but I’m not willing to go the distance. A man who can shine his own shoes also carries the added confidence of feeling his best at all times. Who doesn’t deserve to feel awesome? Shine those shoes like a rockstar, and the rest will fall into place. Unless you’re attending an interview, funeral, or traditional wedding, black and white suits are usually far too formal for most men to master – even Bond as his down days rocking this style. Dapper is all about hitting the right style marks and adding a custom spin to off the rack clothing. You want to own what you wear with bespoke pride, and a quick way to do that is to choose dark grey suits with light blue shirts, and tan (or black) accessories. These colors are complimentary to all skin tones, and won’t make you look like your going to prom. It’s dapper sophistication at it’s finest. Speaking of accessories. They should match. If you’re the guy with a black wallet, brown shoes, and red phone, think again. Stick to one color of accessory to pull an outfit together with precision. The most forgiving colors are dark tans, but even all black or all accent color look fantastic when they match. This shows your thought and consideration to each article of clothing. Don’t believe this magical trick? Look on any clothing store online, and notice how the accessories are always the same color – it’s like interior design for dressing well. Don’t ask us why, just do it. While you might not be planning on showing off the goods, dark underwear has countless reasons to be in a dapper closet. For first, traditional tidy whities are not all that tidy. They discolor, and look tarnished. Not dapper. Secondly, lighter colors don’t look as lavish as darker colors do. This is why manufacturers use darker colors when advertising their supercars, they reek of power and sophistication. No One orders the white Lambo. And no one should be ordering white briefs. Avoid stains, unflattering fits, and stick with black. It matches everything, looks fancy, and doesn’t cost a dime more. Another quick tip for the dapper gent is to always be clean shaven. By leaving your shaving cream on for at least 5 minutes, you’ll add in a necessary pre-shave treatment that will condition the skin prior to shaving. This is will give you professional results at home, and reduces the risk of irritation and shaving bumps and red rashes – again, not dapper. You want a clean, close and comfortable shave every day that sets the canvas for your efforts. If you prefer to wear facial hair then shaving is still a must – be sure to trim under your neckline, your edges, and any stragglers to keep things looking svelte and dapper. Leave a comment and let Male Standard know your life hacks on how to dress dapper!